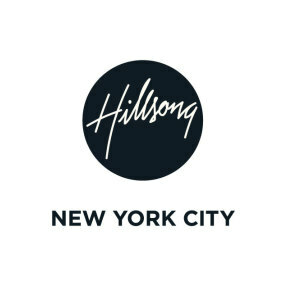 Our vision is not just for people to attend church, but to be the church, transforming New Yorkers into passionately engaged followers of Jesus. We recognize that God has placed within each of us gifts, passions and abilities to build the church and bring the kingdom of heaven on earth. We would love to help you find your place, activate your gifts and see the vision of your life released. We are so glad you’ve come to visit and want to serve you in any way we can. Trinity Grace Church is a family of neighborhood churches we call parishes. 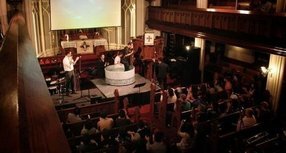 Unlike campuses or video venues, each individual church has its own distinct personality and rhythm, shaped by the culture of its neighborhood, allowing for a contextualized expression of the vision of Trinity Grace Church. Traditionally, to have a parish meant to take spiritual responsibility for a designated geographic area. We believe in the importance of commitment to local community and planting roots to form deep and meaningful relationships in our neighborhoods that can help bring about real change as part of a greater movement of renewal. We are able to share resources and have an exchange of ideas and best practices with one another as we join the larger body of Christ through the city and the world. 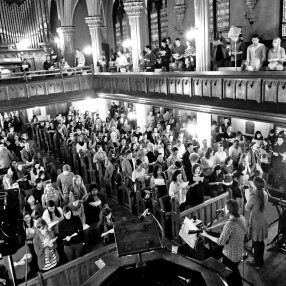 Trinity Grace Church currently has eight parishes in New York City. AJ and Elaina were married in 2007 and joined TGC staff in August, 2011. Prior to New York, AJ planted and pastored churches in Long Beach, California, Atlanta, Georgia and Orlando, Florida. He has earned a Masters in Religion from Reformed Theological Seminary, a Masters in Theology from Columbia Theological Seminary, and is currently pursuing a Doctorate in Ministry from Fuller Theological Seminary. AJ is also author of Urban Disciple: Following Jesus through the Gospel of Matthew. 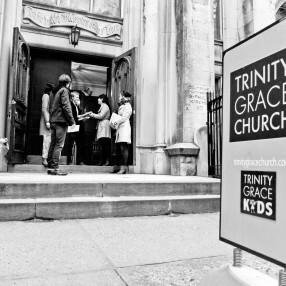 I've visited a handfull of churches in nyc over the year and a half that I've lived here, and Trinity Grace has definitely been the easiest for me to connect with. I like that the church has a very intimate setting, is filled with 20 somethings, and has really powerful/ beautiful worship music. Each message that I've heard has been rooted from scripture and has explained how it can be related to our culture and our lives as young people in this city. I don't think I will ever forget the message delivered from a visiting missionary who gave his testimony on how he took leaps of faith with his direction in life and how as Christians we aren't meant to take the safe road but are to take risks. Trinity Grace is also very rich in community, not only with each other but with people outside of the church, and that to me is what makes a church. 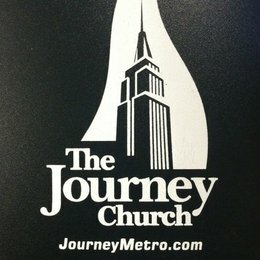 I've lived in NYC for almost 7 years now and have tried numerous churches. Trinity Grace has been the reason I am still here. They are my family. I came because I felt the presence of God and I have stayed because the leadership and community continue to prove their true hunger for the Lord. And while no community is perfect, they have always been in humble pursuit of growing, learning and adapting to the ever changing culture and needs of the city, while still staying rooted in truth. The Chelsea service is my home church where I am apart of the prayer team and Freedom Ministry. Our hearts are to raise up a generation of new yorkers who are passionate and released to pursue the callings on their life with excellence. 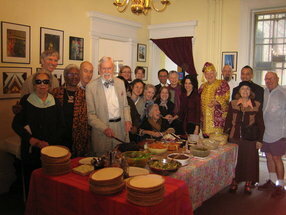 Please come and visit! I just moved to New York City from Seattle, Washington to become a student at The King's College. I came trusting that the Lord would show me which church HE wanted me to attend regularly, so that I wouldn't have to waste my first semester searching for the church that best suited my needs.Trinity Grace Chelsea was that church. I knew within 15 minutes of my first service there. The building itself seemed to have the presence of God, and I was blessed by a warm, welcoming congregation of 200 or so lovers of Jesus Christ (most of them were in there 20's like me). The worship team does an outstanding job of combining Christ-centered worship with musical excellence. They sing dynamic covers of traditional hymns as well as songs that their own team has written to honor the Lord with His praises. Pastor John Tyson is a humble, down-to-earth but passionate and sold-out man of God with an exceptional gift to communicate. His sermons are based on specific passages from scripture (right now we are going through the book of Colossians). He takes these scriptures, discusses their significance in the Christian walk and helps us apply them to our every day lives in New York City.I am so grateful to know that the Lord has a wonderful remnant of believers in this city. Enter your email address to receive an informative welcome email from Trinity Grace Church Chelsea.